Lucknow, the capital city of India’s most populous state is home to a sizeable number of two-wheelers. The city had a road network spanning 3,387 km as of 2011, with the vehicular population increasing 19% annually (average). The state of Uttar Pradesh records an accident every two hours, with Lucknow contributing to a significant chunk of this. Two-wheelers are involved in close to half of all accidents in the city. Given the dangers involved, a good two-wheeler insurance policy can help one offset any financial loss caused by an accident. Almost all the major general insurance companies have a base in Lucknow, with each offering a range of two-wheeler insurance products. Individuals looking to purchase a policy can consider the following options. Note that the names listed above are not ranked in any specific order. Locating a good garage to get a damaged bike fixed can be hard, especially given the size of the city. Insurers aim to offset this problem by tying up with garages, offering cashless service to individuals. One can locate their nearest cashless garage by using any of the following means. Contacting customer care representatives of the insurer and asking them to provide the address. The main drawback with this option is that certain insurers do not have a 24/7 customer care number. One can locate a garage by using the ‘Garage Locator’ feature on the official website of the insurance provider. Most insurers provide this feature. In case of the insurer having a mobile app, one can use this to find a network garage closest to them. One could approach the sales agent who sold them the policy and ask him/her about network garages in their locality. Quality service – One issue most people face when they give their vehicle for service at an unauthorised garage is related to the quality of service. It is common for original parts to be replaced with fakes, resulting in further damage to the vehicle. This, however, is not a problem one faces when they give their vehicle for repair at a network garage. Expertise – The network garages have expert mechanics who are adept at handling any issue pertaining to the vehicle. In case of expensive/rare bikes, finding individuals who are well-versed with the dynamics of the bike can be hard, which is eliminated when one uses the services of a network garage. Simple – The entire process of approaching a network garage and getting the bike fixed is simple. One has to contact the insurer and provide certain details, with the insurer handling the bill settlement and other issues. Quick – Most network garages offer quick servicing, primarily on account of the relationship they enjoy with the insurer. No out-of-pocket spending – An individual might not have to spend money from his/her own pocket, for the insurance company directly settles the bill with the garage. There could be instances where the bill amount exceeds the cover provided, in which case one might be expected to pay the balance. Replacement bike – Certain insurers provide the option of a replacement vehicle until the damaged vehicle gets fixed. Additional services – Network garages provide additional services like delivery of bike, towing assistance, etc. Purchasing a bike insurance goes beyond meeting government regulations. A good policy can help one save a good amount of money on repairs, in addition to offering a financial safety net. With a host of options available, one should consider these points before purchasing the policy. Policy cover – There are two options when it comes to buying bike insurance in Lucknow. While a third-party liability cover is mandated by law, it offers limited protection to the individual. One can opt for a comprehensive cover if they wish to protect their bike as well as themselves. Policy term – One can opt for a policy with a term ranging between 1 year and 3 years. A majority of the policies issued are for a period of 1 year. Choosing a longer tenure can be advantageous, eliminating the hassle of yearly renewal, in addition to offering a better price on the premium. Premium – The premium is decided after taking a number of factors into account. The age of the vehicle, the model, engine size, condition, etc. can impact the amount one is expected to pay. It is a smart option to compare policies from various insurers to get the best rate. Discounts – It is possible to avail a discount on the premium one pays. The most popular form of discount is the No-Claim Bonus, which can help one save a considerable amount each year. Alternately, insurers can offer a discount based on other factors as well. Claims settlement – Choosing an insurer who has a dedicated claim settlement team in place can help eliminate the hassles one typically associates with claims. Service – Insurance companies offer a host of services to customers. These could range from reminders for policy renewal to roadside assistance. Comparing any add-on services can help one get a good deal on a policy. Network garages – Opting for an insurer with a large number of network garages can be beneficial in case of an accident. 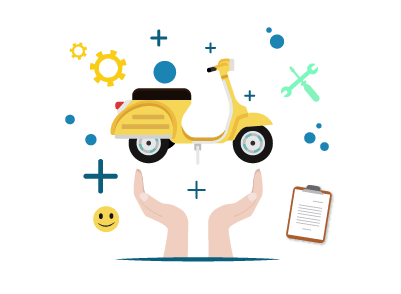 The process of selling a bike in India is pretty simple, but most people overlook the insurance when they buy a used vehicle. Failure to transfer the insurance in the name of the buyer is sufficient ground for the insurer to deny a claim in case of an accident. It is therefore imperative to transfer the policy immediately after the vehicle is sold. Individuals who wish to do the same are expected to follow these basic steps to complete the formalities. Intimate the insurer once a decision to sell the bike has been made. Once sold, provide details of the sale to the insurer. These include documents like the registration certificate, sale deed (if applicable), NOC from the regional transport office, etc. Request the insurer to transfer the policy in the name of the buyer. The insurer will typically issue the transfer after evaluating the documents. The buyer will be expected to meet the eligibility criteria for the policy (if any).